, but whatever you call it, one thing is clear: Lifelong learning is becoming the norm. Thirty years ago, most CEOs likely wouldn’t be boasting about their ongoing program of continuing education, but we live in a new world — one where the demand and ability to keep learning throughout one’s career is something we all need to embrace. As an example, I offer my own personal story. When I was launching my own company back in 2012, online tutoring was still an exception to the rule. Today, it is a booming sector that everyone from Ivy League universities like Harvard, Stanford and MIT to individual strivers are embracing. What’s notable is that to successfully launch my own company, I also had to spend a lot of time engaging in online learning myself. With the arrival of Coursera in 2012, I was able to take courses with some of the world’s top educators on topics ranging from finance and gamification to design and history. More recently, I’ve signed up for a Python course on Codeacademy to broaden my understanding of my own tech organization and improve my data analysis skills. On top of taking these courses, on a daily basis, I listen to audiobooks on Audible and to Apple Podcasts. I also use my own platform to improve my English language skills as I’m not a native speaker. Online learning is my startup’s business, but you might say it is also my startup’s secret to success. On this account, I also know that I’m not alone. A recently released study by a team of researchers at Columbia University’s Teachers College found that the majority of massive open online course (MOOC) learners are university-educated, employed individuals between the ages of 30 and 44. The same study found that most learners enroll in online courses to improve their performance on the job. The people who are doing this, however, aren’t just launching their careers. Lifelong learning is being embraced by everyone and, perhaps, especially leaders. This brings us to the key challenge facing nearly all online learning companies: How does one build a platform for lifelong learners? As the founder and CEO of an online learning platform and as a lifelong learner myself, I’ve discovered there are at least three factors that drive the success of online learning platforms. • First, the most successful online learning platforms thrive because they demonstrate a high level of agility. This agility enables them to respond to learners’ constantly changing needs. Here, Coursera is a good example. When this MOOC provider launched, its target market and mandate were not yet entirely clear. Since 2012, the company has constantly adapted in response to its own research findings, which have revealed its market is primarily comprised of well-educated professionals looking to upskill. This likely explains why Coursera now has a much clearer mandate: to offer targeted courses to help professionals upskill and online degrees in partnership with established universities around the world. • The second factor that contributes to the success of online learning platforms is intelligence. Smart platforms — platforms that rely on some element of artificial intelligence — are constantly collecting and analyzing data to optimize and personalize the learning experience for students. I’m not suggesting that machines make the best teachers, at least not on their own, but I do think the best online learning platforms now leverage at least some form of artificial intelligence or machine learning. • Finally, successful online learning platforms are those one can easily scale. What makes MOOCs and other online learning platforms impactful is that, unlike traditional classroom-based courses, they can be taught to just two or three learners or several thousand learners without compromising the learning experience or drastically increasing costs. This is why online learning is not only emerging as an optimal way for highly educated people to keep learning but also as a way to make education more accessible to unserviced educational markets. 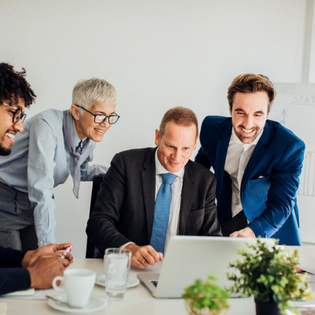 Like many leaders, I believe that lifelong learning is something that everyone will soon need to embrace to move into higher-level positions and even to retain their current jobs. I also predict that online learning platforms will be the primary way we access learning in the future. Unlike traditional forms of education, online learning is flexible, adaptable, scalable and highly affordable or free, making it the ideal way to respond to today’s changing educational needs.